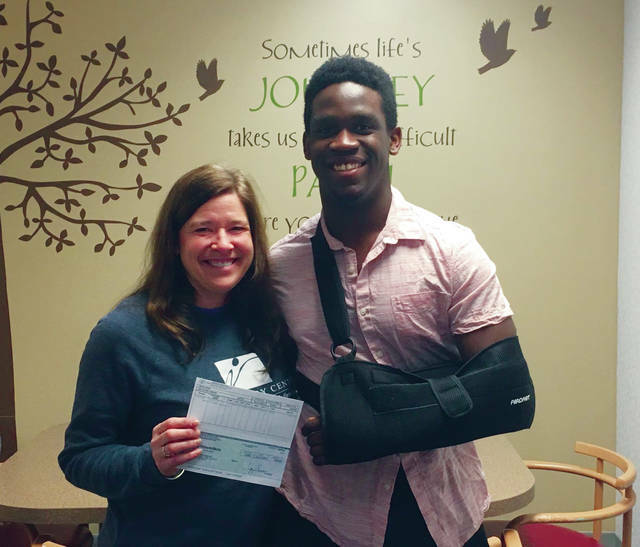 Swanton High School senior Xavier Williams recently donated the money raised during a pink out football game he organized in October. He recently presented donations to The Victory Center, above, and Baskets of Care. It was Oct. 26 at David W. Hansbarger Stadium and the Swanton Bulldogs were set to play their final game of the football season, at home, against the Archbold Blue Streaks. Spectators filled the bleachers in anticipation for the match-up while each team prepared itself for the battle ahead. However, the usual flurry of purple-and-white and blue-and-gold among the players, audience and banners alike was also accompanied by a flourish of pink, representing a different battle beyond the football field: breast cancer, to correlate with Breast Awareness Month. At the center of this pink-out game at Hansbarger Stadium is jersey #56 for the Bulldogs, Xavier Williams. He decided to make the final game of his senior year at Swanton High School one that would resonate for the betterment of his community. He was motivated to give back to victims of breast cancer from his own personal experiences with his mother Maronda Williams, a 13-year survivor of the disease. “A couple of [my] classmates’ parents just got diagnosed, and I remembered going through that,” he said. With help from William’s Hugh O’Brian Youth Leadership (HOBY) group and Maronda, he designed t-shirts and socks with breast cancer awareness-themed designs to sell to his community to wear in the season finale, in effort to make the game a pink-out. “Also, to jazz it up, we sold smoothies during [school] lunches in the month of October,” he said. The money earned from the fundraising would go towards cancer organizations. Once collected, the total proceeds stunned Williams. In deciding where to make his donations, Williams wanted to stress his community, the same place where his mother fought the disease, and where his classmates’ family were just beginning the battle. As a result, The Victory Center, a cancer support organization based in Toledo, was a suitable choice. Baskets of Care, William’s other choice for donation, is a second organization in Toledo that has helped William’s mother and several other breast cancer victims. For both organizations, Williams’ donation has created a strong impact. Gail Cooper, who founded Baskets of Care following her own battle with breast cancer in 2010, expressed her gratitude for the donation and remembered her experience with William’s mother when she fought the disease. “I, along with my Board of Directors, are very proud that he chose us as a recipient of his fundraiser. I have known his mother and family for a very long time. I worked with his mother at the time of her breast cancer diagnosis and had watched her journey along with the family,” she said. In addition, Williams’ actions have impacted his student body at Swanton High School, according to principal Jason Longbrake. Williams’ contribution will make both a present and future impact to several individuals, aiding in their treatment and providing comfort during their fight with the disease, with the help of The Victory Center and Baskets of Care. As the battle to end cancer continues, Williams has words of support to those affected by the disease.